Welcome the the third edition of TompkinsLandscape.com! We've expanded the content and Gallery to over 60 pages of ideas, checklists and other helpful material. 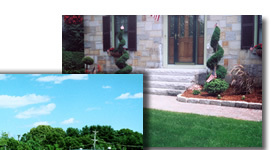 Landscape Design- Click here for different services we offer, as well as sample photos of our work in this area. Winter Services- We don't have just a 'green thumb'! When the weather outside is beginning to look frightful, call Tompkins to handle shoveling, snowplowing and every other task you DON'T want to do...! Irrigation- This area offers information on conservation benefits, frequently asked questions, important things to consider when determining who to use, and other useful stuff. Our Newsletter area is updated annually with different articles of interest. Subjects range from flooding prevention, to our '10-Step Irrigation' process, check back for our latest insights. 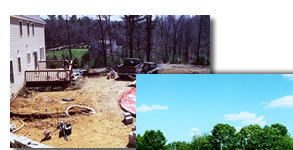 Maintenace- Areas many people may forget about, yet essential in maintaining the original investment you made in landscaping. Click here for more information on our maintenance services. Finally, our Gallery section continues to be expanded, showing a constant variety of stone work, traditional landscaping, irrigation systems; and much more!